Enhance your dog's overall health and wellness with the Pet MD Omega 3 Supplement for Dogs. Omega 3 is an essential fatty acid that offers generous benefits to canine animals. This supplement contains two types of Omega 3 EPA (eicosapentaenoic) and DHA (docosahexaenoic). Both acids are found in cold-water fish and aid in boosting the immune system and reducing inflammation. This fish oil also relieves itching, removes dandruff and dry skin, and reduces hair shedding and other allergy symptoms. Other benefits include strengthening the bones, heart, and brain function, revitalizing canines and restoring them to their optimal health. One capsule provides 1000mg of fish oil (180mg EPA and 120mg DHA) of cold-water anchovy and sardine oil, which makes it a better source than the standard Alaskan salmon oil. Each soft gel contains cold water anchovy and sardine oils. It can be given directly to dogs as a treat. If owners find it difficult to feed to their pets, it can be punctured and applied to dog food. Pet MD's Omega 3 blend of potent ingredients is full of advantageous properties, which is why it is recommended by veterinarians. With Pet MD, you can be sure that what you give your pets is safe and effective. Ensure that your pets live long and healthy lives by giving them the Pet MD Omega 3 Supplement for Dogs regularly! SUPPORTS HEALTHY JOINTS, BONES, HEART, AND BRAIN - Pet MD's Omega 3 supplement aids in maintaining healthy joints of dogs, especially the aging These soft gels strengthen bone, heart, and brain function, boosting the health of your pets. RICH SOURCE OF OMEGA 3 - An essential fatty acid that naturally occurs in fish oils, Omega 3 acts as an anti-inflammatory for dogs. EPA (eicosapentaenoic) and DHA (docosahexaenoic) are two types of Omega 3 fatty acids that are found in cold-water fish. These acids boost canine immune systems and reduce inflammation. RELIEVES COAT AND SKIN PROBLEMS - These oral supplements soothe numerous issues concerning canine fur and skin. They relieve itching, dandruff, and dry skin and reduce hair shedding and other symptoms of dog allergies. Essential Fatty acids promote healthy skin and coats, returning your dog's coat to its shiny original feel. 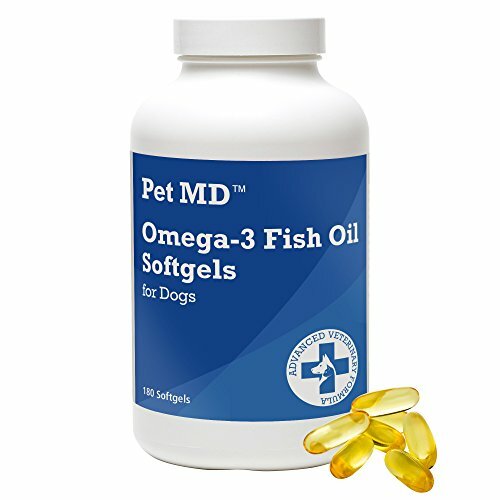 PROMOTES OVERALL HEALTH AND WELLNESS - Pet MD Omega 3 Fish Oil is filled with potent ingredients that provide numerous health benefits to dogs. Each softgel covers all the bases and promotes the overall well-being of our canine pals. This health supplement is veterinarian recommended, so you can be sure that its safe and effective. FISH OIL SUPPLEMENT - One capsule provides 1000mg of fish oil (180mg EPA and 120mg DHA). This product contains cold water anchovy and sardine oils. It can be given directly to dogs as a treat. If owners find it difficult to feed the soft gels to their pets, they can puncture and apply it to dog food.